Modway has been in the industry for a very long time now and is in fact a reputed brand name in beds and mattresses category. The biggest advantage with Modway Horizon bed frames is the wide range of colors it comes in. Yes, it comes in nearly nine different colors and you can choose your frame as per your room’s décor. Master bedroom, guests room or kids room, Modway Horizon bed frame comes in every color to best fit any room décor. Modway bed frame is entirely made from reinforced stainless steel. The frame can comfortably sustain weights up to 1300 lbs which again is prescribed capacity. Still 1300 lbs is more than sufficient even after considering two heavily built people sleeping on it. Modway Horizon has employed 12 legs construction and this is like the highest number of legs any bed frame can have. 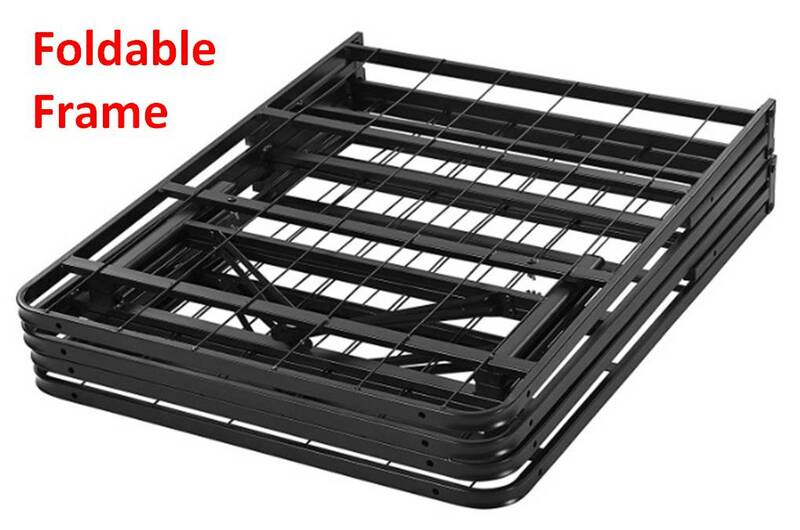 This design effectively supports any weight capacity without leaving any scope for breaking or bending of frames sides. As many as 6 legs run just along the middle section so as to absorb maximum pressure emanating from bodily movements. All legs are capped and protect the floor and carpets from scratches. Modway Horizon is a foldable bed frame and we can surely call this an advantage. Foldability offers the flexibility to pack and store the frame compact when not in use. Just remove the leg units, fold the frame and store it. But in case of non-foldable frames, you need to remove the entire frames, the sides, steel slats and leg units which needs relatively more time and effort. Like all bed frames, even Modway has designed its Horizon bed frame model to work standalone without the need to have additional box springs. Yet, if you still wish to use a box spring, the frame does support. The head section units of the frame do not come with slots to attach headboards. However, there are always these brackets that are sold separately and you can use them to attach headboard, if you wish to. 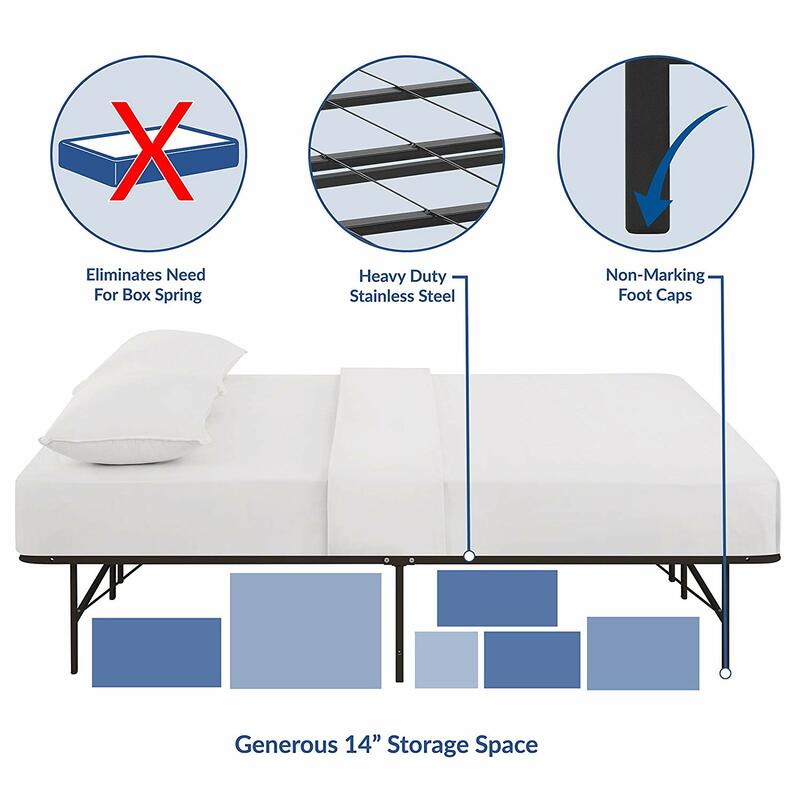 All types of mattresses, memory foam to Tempurpedic to latex and innerspring, all are compatible with Modway Horizon. And there is no special need to have even flat boards as the frame’s sleeping surface has both horizontal and vertical steel slats which offer perfect even surface for placing mattresses. The Modway Horizon is a 14 inch high bed frame and offers 13 inches of under the bed storage space. 13 inches storage space is standard in bed frames segment and it is neither too spacious nor too less. As the bed frame comes folded and half assembled, there is not much of assembly to be done. Just stretch open the frame, fix the leg units and fix the connectors between the frame’s sides and leg units. That’s it, your bed frame is ready to use. Modway is the lightest of all bed frames on the maret. It weighs mere 41lbs, is foldable by design and easy to store or transport. Although there are dozens of bed frames in the market that come at more or less the same price but the unique selling point of Modway Horizon is the wide range of colors. Yes, if you are too choosy that your bed frame has to match with your rooms’ décor then Modway Horizon is the best available option. Made entirely from steel, it offers great sturdiness and easily supports weights up to 2000 lbs which make it a definite buy.